No matter what kind of job interview you have coming up, it’s likely they will ask you several if not all of these questions. 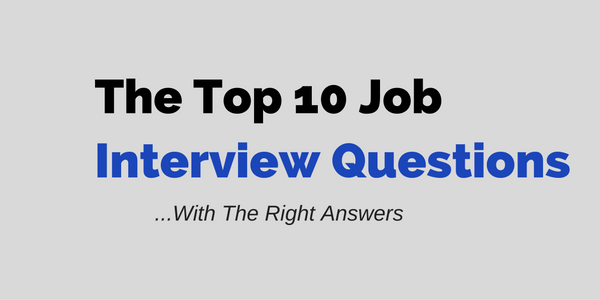 So I want to share with you my best tips for answering these top 10 interview questions. 4. What Are Your Greatest Strengths? 5. Why Do You Want to Work Here? 7. Where Do You See Yourself 5 Years From Now? 8. What is Your Biggest Accomplishment? 9. What is Your Biggest Weakness? 10. Do You Have Any Question For Us? These are the 10 most common questions a hiring manager, recruiter, or interviewer will most likely ask you on a first, second, or even third job interview. To make answering these top 10 questions easy for you, I’m going to break down each question in to all the Do’s and Don’ts so it will be blatantly obvious how to answer them, and as equally important, how NOT to answer them. Since these are the most popular interview questions, you’ve probably seen or heard of them before, and you may think you know how to answer them. These questions have been around for a long time and interviewers have been asking them since people started interviewing for jobs. Even though they are old questions, one thing has changed: The best way to answer them for the current times. Back in the 80’s and 90’s, your answer to any of these top 10 questions would have been different than the way you would answer it today in 20xx. And I’m going to show you how to answer these questions for current times. No doubt, there are many other questions you will be asked on your interview, but these are the root questions. You need to know these. Once I show you how to answer these top 10 questions, I’ll show you where you can a complete list of other common interview questions and answers with a break-down on the best way to answer each one. 1.) Tell Me About Yourself. This is probably one of the oldest interview questions ever, but I guarantee it will come up at every interview you have for the rest of your career. Plus, it’s not just for job interviews either. I’ve been asked this question in sales meetings, luncheons, and even while shopping for a new car. How you answer it depends on the context in which the question is asked. Obviously, I’m going to cover it from the job interview point of view. Don’t just think you know how to answer this because your answer could negatively affect whether or not you get the job. You want to take your time and practice what you’ll say when answering this Top 10 question. Even seasoned professionals who have been interviewing for 20+ years still fumble their answer to this question which is why you want to be prepared. DO THIS when answering: Tell me about yourself. Keep your answer brief and related to your career and the position. Keep your answer on topic and work related while talking about your journey. Tell your interviewer how you got started in your profession, perhaps where you went to school or what got you interested in your profession in the first place, and then gloss over a few jobs and tell them what you like about your profession and where you see yourself heading. Tell them of a few things you learned along the way and how those things have strengthened you. Before your interview, and even during the interview, find out what they are looking for in the ideal candidate for this position. This could be experience, leadership capabilities, management qualities, technical skills, etc. Find out what is important to them and weave those things into the fabric of your answer. That way, you sound exactly like the person they are looking to hire. Don’t bring up un-related experience when changing careers, it’s pointless unless you are tying in transferable experience. Don’t end your answer with a question back to the interviewer. Some people think this makes the applicant look smarter when they ask a follow-up question after delivering their answer, but for the most part, I think it’s a poor strategy unless a follow-up question presents itself naturally. 3.) Talk about what you are looking for and where you see your career heading. Get your answer down to 30-45 seconds at the most. Keep watching your video and polishing your answer until you can deliver it flawlessly. And when I say flawlessly, I don’t mean from memory, but deliver it naturally, and it should sound slightly different each time you say it. 2.) Why Did You Leave Your Last Job? Unless you’re still working, you will get asked this question. Even if you are working, they will ask you why you want to leave. But more often than not, if you are not working, chances are that you were laid off, terminated, or quit. You just have to let them know the reasoning behind why you are not working at your most recent job. If you left of your own free will, then explain why you left and what your plans were in doing so. If you were fired for performance reasons, a simple explanation is all that is needed, but make sure this will not affect the requirements for this new job. If you were laid off, let them know several members of your team were laid off due to the economy and slowing product sales. But warm that up a bit and put it into your own words so it makes sense. DO THIS when answering: Why did you leave your last job? If you left of your own free will, tell them why you left and reflect positively on your former employer. Tell them it was a hard decision to make but you felt it was the right choice for you. If you were fired, be as brief as possible in your explanation and accept responsibility for what happened. If you were laid off due to downsizing or the economy then tell them this as long as it’s true. Don’t say that the pay was bad and you wanted more money. Don’t say that the hours were terrible. Don’t say that you could not get along with your manager. Don’t lie if you were terminated. Don’t defend yourself or place blame on the employer. Download sample answers to: Why Did You Leave Your Last Job? Remember, you are not there to defend why you were fired. You are there talk about what you can do for them, so it’s very important to keep your answer brief when answering this question. If they want to know more, they will ask you, but don’t volunteer too much information because it will make them more cautious about you. More than anything, if you were fired, accept responsibility for what happened because this shows courage and then explain that they were right and you were wrong, but that you learned from this experience and are a better person because of it. Although the interviewer asked how “you” dealt with or solved the problem, he really wants to hear how you worked with a team of people to tackle the issue. This is a problem solving question that tests your critical thinking skills in two ways: Your definition of difficult and how you handled the situation. This is a great question to show that you are a creative and capable problem solver. You should have at least one of these stories ready to go all the time. DO THIS when answering: Describe a difficult problem and how you dealt with it. Prove you are capable of handling any problem that may arise in your new role. Your story should be one in which you were put in a tough position and analyzed and discussed the problem, reached a conclusion, and came out on top. Talk about the people you had to work with, what was expected of them, and how you tied it all together to reach your goal. Your best selling point in answering this question is a success story. The story you tell should demonstrate that you have everything required to excel at this job. Don’t say bad things about past colleagues, managers, or your company. Don’t tell them a rambling story that jumps from one story to the next. Don’t tell them how you fixed a light bulb or un-jammed the copy machine. Avoid telling a personal story, unless you have nothing else. The best way to answer this top 10 question is by using a good team player example. Maybe you had to work with some very difficult people to accomplish a project or task that no one else wanted to work with, but you were able to get everyone working together to complete the project with a tight deadline while keeping everyone in line and getting the whole project completed on-time and under budget. You want to setup your answer using the S.T.A.R. behavioral method where you talk about the Situation, the Action you took, and the Results you achieved. 4.) What Are Your Greatest Strengths? They are asking you this in a broad sense. So ask yourself: What are you best at doing? Are you a good leader? Are you a skilled time manager? Are you a great communicator? Are you a detailed planner? Are you good at convincing others? Whatever you are best at doing, give the interviewer the top 2 or 3 things you excel at. DO THIS when answering: What are your greatest strengths? Research the job description to find out what they are looking for and leverage your strengths to match. If leadership is something they are looking for talk about your experience as a leader and projects you have successfully led. Your strengths should be aligned with the requirements of the position you are applying for. Talk about your strengths as a solution to their problems. Don’t rattle of a list of strengths that are out of context with the job. Don’t list personal strengths, like that you’re a good parent. Don’t list strengths that you are unable to articulate through work experience. Don’t say you’re not sure. Don’t tell them you don’t have any. Don’t be modest when you answer because this is an opportunity to sell yourself. Download Sample Answers to: What Are Your Greatest Strengths? 5.) Why Do You Want to Work Here? This is a genuine question and all they want to know is what you like about their company, it’s products or services. What is driving you to want to work for them? Have you always had a lifelong goal of working at Google, or Goldman Sachs? This is your chance to express why you want to be a member of their team and most importantly the contributions you feel you’ll make as a loyal employee. This question helps weed-out desperate job seekers who are just looking for a job, not a lifelong career. DO THIS when answering: Why do you want to work here? Tell them what you like about their business. Is it their products, reputation, services? Whatever it is, express your genuine interest. This is a great time to compliment them on their products or reputation. Dig deep to find out what it is that attracts you to them and express this. Don’t tell them you like their location. Don’t tell them you heard that they pay well and have great benefits. Don’t tell them because you heard it’s a great place to work. Don’t tell them because your friends work there. Don’t tell them you want to work here to get some experience. Download Sample Answers to: Why Do You Want to Work Here? Try to connect your reason for wanting to work there with something personal or emotional. Maybe when you were a kid, you saved a kitten from harm and it made you feel good and since that moment on you knew you always wanted to help animals and that’s why you want to be a vet. 6.) Why Should We Hire You? This question is your best opportunity to prove you are the best candidate for the job. The key is to discover what they are looking for so you can tell them why you are the best fit. Since you’ll be competing against many other seasoned professionals, you need to articulate why your qualifications make you the only person for the job. Let them know that because you did [blank] in your last job, here is how you can do [blank] for them in this job. Connect the dots for them and show them why you are the best choice. You will need to do some extensive research to know what the company is looking for. The best place to get this information is the job description because employers leave all kinds of clues in there. The best way to answer this Top 10 interview question is by proving how you can help the company solve their problems. DO THIS when answering: Why should we hire you? Prove that you understand their problems and can help solve them. Talk about your understanding of their business, competitors, and challenges in the industry. Tell them how you have been successful before. Let them know that in your last job you were faced with similar problems and you solved them by doing [blank] and then explain how you can do [blank] for them. When you connect the dots like this and demonstrate your understanding of their business problems they will see you as the obvious solution to their problems. Don’t give a vague answer. Don’t answer their question with a question. Don’t be arrogant with your answer. 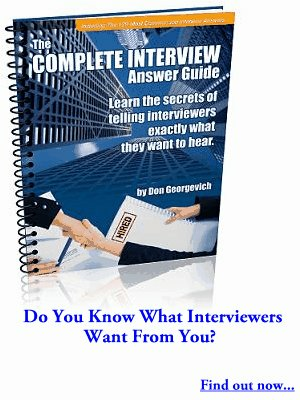 Download Sample Answers to: Why Should We Hire You? This is a great opportunity for you to sell yourself and why you are the best person for the job. Get your resume and put it next to the job description and draw lines from the job description duties and requirements to your resume and then talk about your experience as a solution to their problems. And that’s why they should hire you. 7.) Where Do You See Yourself 5 Years From Now? Many job seekers are afraid to answer this Top 10 question because an answer that is inconsistent with the current position could disqualify them. But at the same time, who wants to be doing the same thing for the next five years? The best and safest way to answer this question should be based on the logical progression of the position you are interviewing for. That way you’re showing them you want to do the current job at hand, but as you get better at it, you would like to take on more responsibility and grow in that position. DO THIS when answer: Where do you see yourself in five years? Your answer should reflect commitment to the job. Give them a real plan for this position and where you see yourself going in it. Show them how you’ll do it and the resources you’ll need along the way. Prove you have solid plans on how to attain your future goal. Since they are looking 5 years in the future, allow them to visualize you in this position 5 years from now. Show them a natural progression of you in this role. Be realistic with your 5 year plan. Don’t tell them your plan is to use this position as a stepping stone in your career or they will feel like you are using them for your own personal gain. Don’t give them an impossible, unrealistic 5 year plan. Don’t tell them you want their job – that is far too threatening. Don’t tell them you want to work here for a while and then move to another company that is your dream job. Download Sample Answers to: Where Do You See Yourself 5 Years From Now? Start with your short term career goals or goals for the position and then move towards the long term and explain WHY that is the direction you want to move in. If you don’t say why, it’s harder to figure out if you are just sprouting off a meaningless answer or if your heart is really in it. “In the short term, I plan to work as a [blank] and focus on [blank]. Then as I progress in this role, I could see myself working into [blank] area. 8.) What is Your Biggest Accomplishment? Though many believe this is the same as the other Top 10 question, “What is your strength?” but it’s a completely different question. Here’s why: An accomplishment is a noteworthy high-profile task or project that you worked on or completed. Basically, you accomplished something and it may or may not have played to your strengths. Your strengths might be in managing people, but your biggest accomplishment was writing a paper that was published in Scientific America Magazine. Do you see the difference? DO THIS when answering: What is your biggest accomplishment? It is best to talk about a noteworthy accomplishment that is aligned to the requirements for the job you are applying to. Treat this like a behavioral question and use the STAR Behavioral method to answer it. Set up the Situation, then talk about what you did (the Action) and then about the Results of what you, your project, or team accomplished. It is best to use a work-related story, but if you’re out of good stories, consider using a personal accomplishment as a last resort. Don’t think that you need a grand accomplishment where you saved your last company from failure. Don’t use a personal accomplishment unless absolutely necessary. Avoid using an accomplishment that does not cast you as the hero. Avoid using an accomplishment that is not related to your career. Download Sample Answers to: What is Your Biggest Accomplishment? Pick something you did in your career that has meaning to you and helped your last or current employer. Pick something you enjoyed doing and it made you feel good about doing it. Optimally, pick an example that is related to the job, your career, or the type of company you are interviewing with. 9.) What is Your Biggest Weakness? Most people are afraid of this question because you are being asked to talk about something you are not good at. But if you’re like everyone else, you have a lot of weaknesses, even I do, so don’t sweat it. 1.) Talk about a weakness and what you have done to overcome it; show them how you have turned into a strength. 2.) Talk about a weakness that isn’t related to the job, perhaps a personal weakness. 3.) Talk about a weakness as it’s a weakness for you, but the interviewer will see it as a strength. That’s my personal favorite way to answer this question. DO THIS when answering: What is your biggest weakness? When talking about your weakness, show what you have done to overcome it so it’s not a weakness anymore. Talk about a weakness that is not related to the job. Talk about a weakness so that your interviewer sees it as a strength. Don’t say that you don’t have any weaknesses, personal or otherwise. Don’t tell your interviewer that you are perfect in your work and have no weaknesses. Don’t tell them a real weakness because chances are it’s not really a weakness at all and you are just being overly critical of yourself. Don’t worry, we all are. Download Sample Answers to: What is Your Biggest Weakness? If you have absolutely no idea what to say, consider saying something like, “I can get frustrated with people who miss deadlines, especially when my work depends on them completing theirs.” Don’t say that you blow up or anything like that, just simple frustration. 10.) Do You Have Any Questions For Us? This Top 10 question usually hits job seekers like a ton of bricks and most of them will simply “No.” That’s the worst response you can give because it signals to the employer that you are not very interested in this position. Anyone who is seriously considering making a job commitment to an employer will have many questions. If they don’t, then they are not serious about the job or are desperate and willing to take anything. You should have a handful of questions already planned out before your interview. You want to ask questions that will help you qualify this company as a place you want to work. You may not realize this, but you are interviewing them too and you have the right to tell them “No thanks” just as much as they do. DO THIS when answering: Do you have any questions for us? Ask meaningful questions that will help you qualify them as an employer. Your questions should reflect what you can do for the company. Ask questions about their goals for the position to demonstrate your sincere interest. Highlight some of the things you discovered about the company through your research. Ask the hiring manager if they feel you would be a good fit for this position. Don’t ask random questions for the sake of asking questions. Don’t ask questions that are unrelated to the position. Don’t ask about benefits unless you are wrapping up the interview or you’re on the topic of discussing salary and benefits. Download Sample Answers to: Do You Have Any Question For Us? Create of list of questions before the interview that will help you qualify this employer. Ask questions that will help you decide if you want to work there or not. As you are going through your interview, weave in your questions throughout the interview and get them answered. Because you don’t want to wait until the end to ask all of your questions as you’ll likely be out of time. As you ask questions throughout the interview, your interview will be more like a conversation and you will be viewed as a strong and genuine candidate, one who is truly interested in this job and is doing his/her due diligence. Okay, there’s my list of the top 10 job interview questions with my personal advice for answering each one. Overall, you want to focus on what you can do for the employer instead of the benefits you’ll receive by working there. Download my Free Top 10 Questions Guide that has multiple answers for each one of these top 10 questions. Author of 4 top selling interviewing books, speaker, and job interview strategy coach. The one person everyone calls on before a difficult job interview. that sounds like a great idea. let me know if I can help. The question why leave you last job needs to answer smartly. The question will turn your interview in the different direction if you don’t take precaution. The interviewer wants to know, is there any problem with you in the previous company. There are chances that you have left the previous job because you were not the performing employee. If that is the situation then the interviewer might not select for this job. This sounds like a great idea. Awesome question and answers. These questions will help the youth in their job struggle including me. Keep blogging. I appreciate your online lesson on “Job Interview Questions”; it helps me in my future job seeking and also in helping others as a guider. So would you send me the video. Do you have this in a pdf formart? I would like to print it out and read it. My email address is [email protected] Thank you. This help very much.